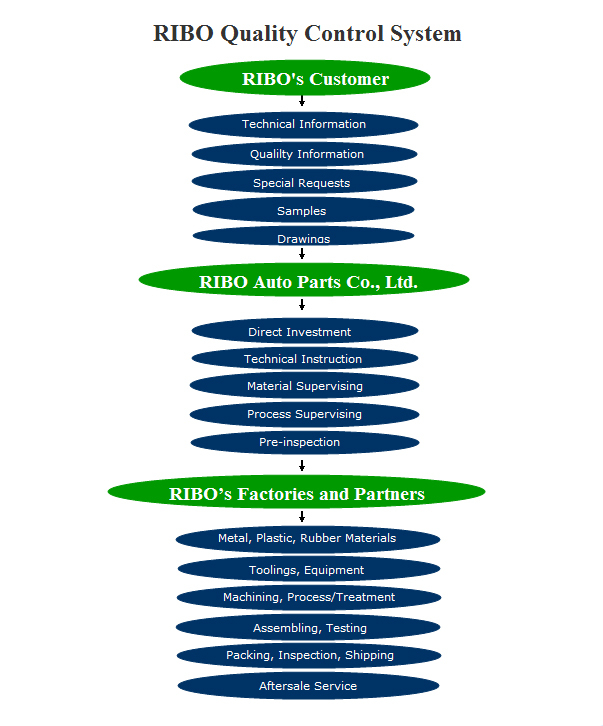 RIBO Auto Parts is committed to providing our customers with quality products that meet or exceed their expectations. We strive to foster an atmosphere of continuous improvement and mutual respect among employees, suppliers, and customers. Our engineers and technicians are highly qualified and specially trained in modern automotive components manufacturing technologies. Further, with state-of-the-art equipment, all the factories adopt Total Quality Management (TQM), Just in Time (JIT) and Statistical Process Control (SPC) methodologies to implement strict production and quality control procedures and ensure that every component meets OEM standards or exceeds the requirements of aftermarket. Our factories are ISO 9000:2000, ISO:TS16949 qualified and are supplying both OEM and aftermarket. • Provide quality products by striving to exceed the defined needs and expectations of our customers. • Develop a documented Quality Management System to foster continuous process improvement and problem prevention. • Define and implement the Quality Management System based upon employee involvement and a commitment to excellence. • Give all employees the training and support needed to provide quality products to all customers. • Communicate our mission and quality objectives to all employees, and assign individual responsibilities. • Use statistical methods to monitor quality performance and analyze problems. • Establish and maintain a working environment that supports the production and delivery of high quality products. • Develop and maintain a team approach that enhances competitiveness through increased quality and productivity.